Lass uns Leute kennenlernen und Bier trinken! Jeden Mittwoch spielen wir Filme! Jeder ist willkommen zum Kinoabend! Every Wednesday we screen German films, and everyone is welcome to come! 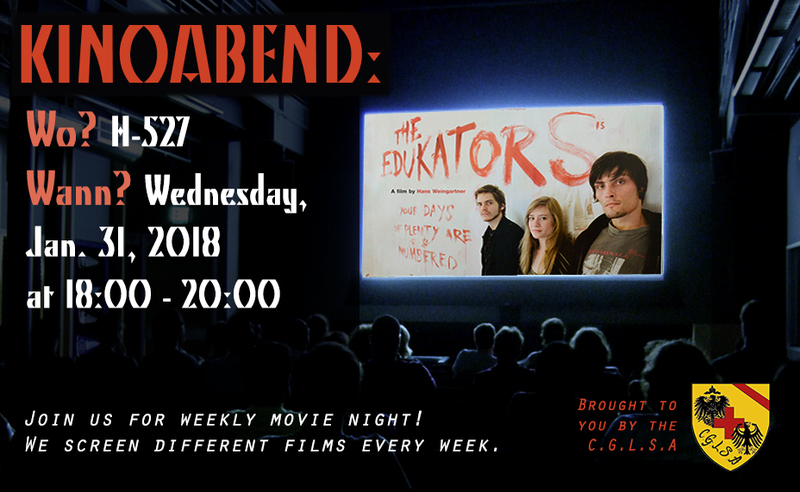 Join our last Kinoabend! Episode 7 and 8 will be screened, the last of the mini-series! On Thursday night we will be screening the award-winning mini series Altes Geld! On March 2nd we will be screening episodes 5 and 6 in H-527 at 18.30! Join us every Thursday between 10:00 a.m. and 11:00 a.m. for our weekly coffee hour. You will have the opportunity to practice your German and study with us. Please bring your own mug for coffee and some patience as we learn a new language together. Snacks will be provided. All proficiency levels welcome. We will be having an Oktoberfest celebration at Fiddler's Green this evening! Entry is free, authentic German food, along with a beer or cider will be served together at a reduced price while supplies last. For those interested in studying abroad, our current DAAD ambassador will give a presentation on scholarship/exchange opportunities. Our infamous speaker, Christian Kracht, who will be doing a reading of his book, Imperium at Concordia. Do not miss this one in a lifetime opportunity! Join us for some delicious treats and coffee, and start your day off with some wonderful company! We will be in H661.2 every Wednesday, from 11:45 a.m. to 1:00 p.m.
Join us at Fiddler's Green as of this upcoming Tuesday, January 19th, from 6:00 p.m. to 8:00 p.m. Meet other students in your program and enjoy a relaxing evening atmosphere with us! Join us for Trivia Night with the PSSA and the Translation Association! Food and beer are supplied for you until quantities last! Want to get involved in student life? Want to become part of the CGLSA Student Executive! This is our final event of the semester and of this year, so come celebrate with us and your German student community at Trois Brasseurs on the corner of Crescent and St-Catherine as of 6:30p.m.! See you there and don't forget those mugs of yours! Stammitsch is back tonight at our usual location, Speakeasy, just downstairs of McKibbins! All levels of German are welcome! The CGLSA will be part of the Concordia International Student Association's Cultural Fair next week Tuesday, from 12PM to 2PM on the seventh floor in the H-Building. 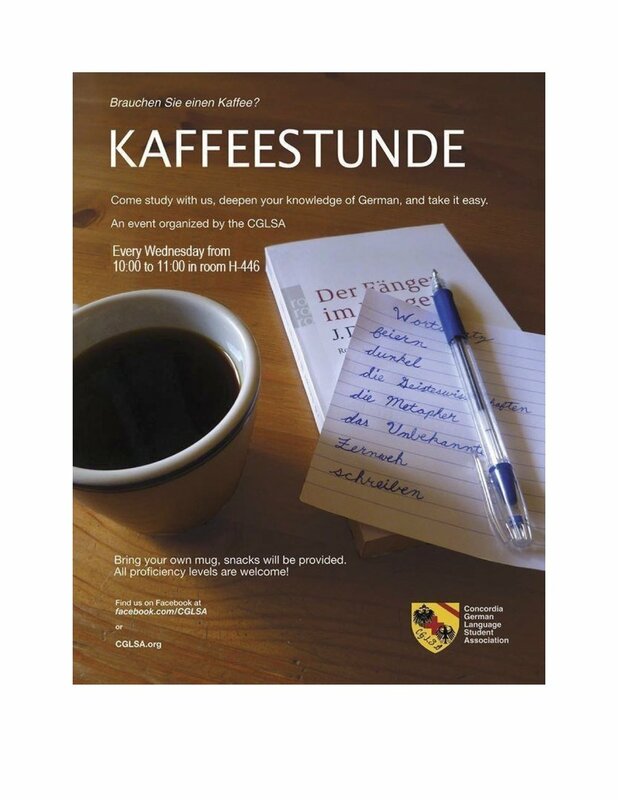 Join us for some free traditional German goodies, support us and the other student initiatives while discovering cultural delicacies and traditions!